Safety steps, step units and kick steps are all designed to provide safe working platforms from which you are able to safely work from, up off of the floor. Commonly seen in use within a multitude of different environments such as retail stores, supermarkets, grocery shops, oil rigs and offices to name a few, our kick steps and safety steps are suitable for a vast array of industries. Manufactured in our UK factory, the Supertuff Safety Step combines durability with style, offering a robust and hard wearing step unit that would look good and function well in any workplace. The STSS01 Supertuff safety step has been designed and developed by ourselves to provide a long lasting, safe platform that is ideal for use in almost any environment. Perfect for use within shops, storerooms, factories, warehouses, library's and supermarkets to name a few, these step units are incredibly robust and can cope with use within the most demanding environments, even the likes of manufacturing plants and offshore oil rigs. Providing a hygienic safety step unit, the Supertuff safety step is manufactured from food grade polyethylene plastic, making it ideal for hygiene sensitive environments such as high care areas within food manufacturing and pharmaceuticals. Incorporating a very stable, large square base the safety step allows for four way access. Rotationally moulded, the plastic is extremely tough and because the safety step is produced using a single one-piece mould there are no loose or breakable parts to consider. Anti-slip tape is fixed to the safety step on each of its in-steps as well as the top platform, providing added grip for the user. 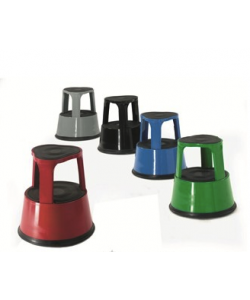 The STSS01 plastic safety step is available in a plethora of colours, allowing for colour coding in high care environments. Space saving, these step units inter-stack with one another and so save on large amounts of space when not being used and during transportation. A stylish step unit, the STSS01 incorporates a large recessed label area, allowing you to brand the step with your own message or company logo. For further information on labelling services, please feel free to contact our dedicated sales team. A common site within retail stores and supermarkets, the KA003Z is a plastic kick step that is easily manoeuvred and provides a durable working platform. Incorporating a spring loaded safety feature, the kick step can be effortlessly moved to where it is needed and then once pressure is applied, the kick step locks into position. 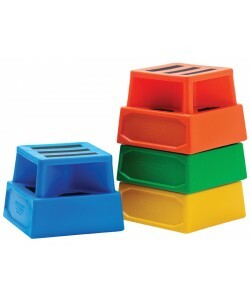 Available in an assortment of five colours, these kick steps have a rubber platform, helping to provide ample grip for you to work on. Spring activated, the S215 stainless steel step unit is an ideal safety step unit for use within the likes of food manufacturing environments, where hygiene is imperative. Providing a safe and stable platform to work from at a height, this step unit has 3 anti-slip platforms and hand rails for the user to hold onto. 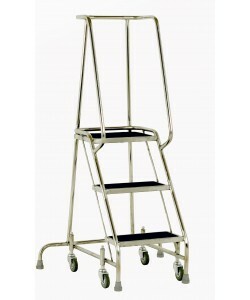 Perfect for stock rooms these stainless steel step units offer a long lasting and rust free solution.